Please note this article was written in response to HP's original $100 off weekend sale. The "$200 off" refers to the additional $100 coupon offered by Staples. The other information and observations in this article are still valid except that Hulu has started blocking Touchpad access to its content. If you've been shopping around for tablets, I'm sure you know about this weekend's fire sales on HP's new tablet that can get you up to $200 off the $500 list price of the 16 GB model. But even at that price, is it a tablet you should consider? I've had one for almost a month now and my answer is I wouldn't, but you might. The tablet runs HP's webOS, which is built on Palm's Linux-based mobile OS that came along with HP's purchase of the company last year. Note that the observations that follow are based on the 3.0.2 update that just was released. The update didn't seem to make much difference from the first release from what I could tell. HP appears to be backing webOS for the long run, including integrating it into (onto?) Windows on all its desktop and notebook computers next year. But that's really irrelevant since you all know better than to buy something based on a manufacturer selling futures, right? And the real question is how many developers HP can lure, cajole and bribe away from iOS and Android development. Right now, what you'll get is a tablet that tips the scales on the higher end of the current crop of 10" tablets at 1.6 pounds. Yes, this is heavier than an iPad2 or Samsung Galaxy Tab 10.1, but that's not a deal-killer in itself. What is a turnoff is that with all that weight, HP chose to make the TouchPad as closed to expansion as both the iPad2 and Tab 10. There is no SD slot (micro or full-sized) and no HDMI port either. So you get a fatso tablet without the full-sized port goodness provided by, say, Toshiba's Thrive. So unless you use a cloud storage option like the Box.net app (the only cloud storage option I found and which comes with 50 GB free for TouchPad users) the internal storage on the model you buy had better last you. At least HP had the smarts to design the TouchPad to charge via USB. And even better, they use the same cable to connect the (standard) micro USB port to the D-battery-sized charger and a host computer USB port for file transfer. This makes it very convenient for travel and for emergency charging from a computer USB port. The TouchPad has a nice 10" IPS 1024x768 multi-touch screen with the wide viewing angles that IPS is known for. The Beats Audio sound is surprisingly good and while you don't get deep (or even much) bass, the sound is fuller than most of the other tablets I've tried. It's good enough that I can stand listening to Pandora (an available app) for more than a few minutes. As other reviews have noted, the TouchPad isn't a speed demon, even with the 3.0.2 update. You'll find yourself watching the pulsing icon in newly launched app "cards" more than you'd like, especially for web-based apps. But I wouldn't say speed (or lack thereof) is a reason not to buy. If you're considering the TouchPad, you have to come to grips with the same issue that is taking the wind out of BlackBerry's aspirations for its PlayBook tablet: apps. Buying a TouchPad means you're choosing a product that's a distant third or fourth behind Apple's market leading iOS and Google's second place Android. 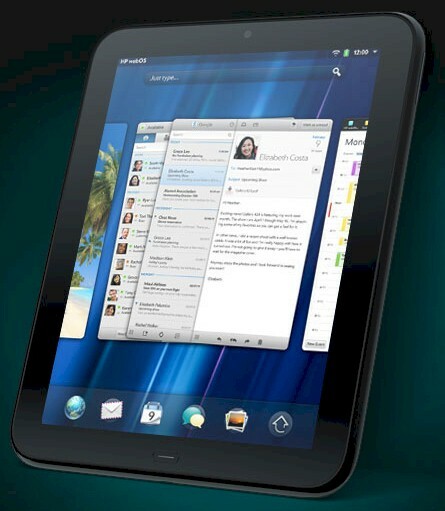 Fortunately, HP didn't repeat BlackBerry's mistake and ships the TouchPad with email, calendar and contacts apps. I had no problem setting up email with an IMAP account and the app also works with Google, Exchange, Yahoo!, MobileMe, and POP3 mail flavors. The mail app ties multiple accounts into a single view—HP calls this Synergy You'll also find similar multiple service consolidation abilities in the messaging (AiM, Google, Skype, Yahoo), calendar (Facebook, Google, Microsoft Exchange, Yahoo) and contacts (Facebook, Google,LinkedIn, Microsoft Exchange, Skype, Yahoo) apps. I entered my Skype account in the messaging app and found it was very tenacious in keeping me logged in. I had a few cases where I had a Skype call come in and was surprised when the sleeping TouchPad sounded its new-agey ring. Seems that it had been running Skype in the background, even though I thought I had shut it down when I discarded the Messaging app "card" (the convention webOS uses for running apps). Turned out that the only way to shut down Skype was to change my status to Offline. By the way, Skype on webOS makes and receive video calls. Before I move on, I'd like to give props to HP for its Pivot app catalog "magazine". The curated approach is nicely done and I even found myself reading some of the articles. The obvious effort it takes to produce something like this, however, makes you wonder how long HP can / will keep it up. HP's would like you to believe that the TouchPad is a great media consumption device. So you would think that means it supports Netflix, but you'd be wrong. There is no Netflix app and trying to play Netflix content in the browser redirects you to the good old Watch Instantly message 51 page (system requirements). HP has instead partnered with Roxio for its MovieStore app where TV shows are $1.99 to buy and current movies are $15.95 to buy or $3.99 for a 24 hour rental and older films are $9.95 / $2.99. On the other hand, I was surprised to find that you can play Hulu and Hulu Plus videos in the browser! Unfortunately, the frame rate was slow and audio wasn't sync'd on the Daily Show episode I tried. The built-in browser handles both Flash and HTML 5 video without hassling you for downloads—both come built in. I was surprised to find that I could play content on NBC.com, which is blocked on Android tablets. But the 30 Rock and Harry's Law episodes I tried were very jerky. And don't get me started about unusually high number of commercials that you need to watch (thanks CableTown, er, Comcast). HTML5 play was disappointing. The normally good NY Times videos were heavily pixelated and low frame rate. Some of the test videos at html5video.org played, usually "shelling out" to what I assume is the TouchPad's native video player, while others didn't. I even tried a few trailers at Apple's Movie Trailer site, but didn't have much luck. At least I didn't get prompted to download a Quicktime player. But selecting a video to play brought up an odd screen that then shelled out to a full screen player, that finally threw a "can't play this content" message after spinning its wheels for awhile. The rest of my video experiments are summarized in the table below. All were played in full screen mode. Although web video is a mixed bag, I was impressed by the TouchPad's built-in media player. I transferred the same group of test files that I use for testing Android tablets to a single folder in the TouchPad root directory that appeared when I connected it to my computer in USB mode. By the way, the TouchPad threw a cutesey "Ow that hurts" message when disconnected from my Win XP SP3 and Win 7 machines, even though I safely disconnected as far as Windows was concerned. Anyway, the audio player played both MP3 and M4A test files without a hitch. It took me awhile to figure out that the icon for what looked like a photo viewer also was the video player. Although it wouldn't even show the MJPEG AVI file, it played all of the H264 files, even the "1080p" Apple trailer as perfectly as if they were being played by VLC on my Windows desktop. Every file played clearly and at full frame rate, something I've yet to see using any video player on any nVidia Tegra2 based Android Honeycomb tablet! If you've read through or just jumped to the bottom line, here it is. Long term viability of the webOS platform. If in the end you decide to go for it, leave a comment below and tell me how you like your purchase. Happy hunting.